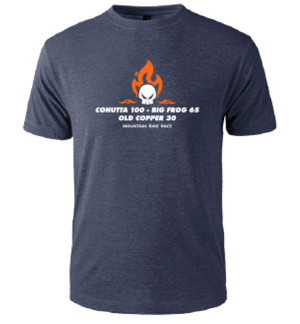 2019 Cohutta 100 - Big Frog 65 - Old Copper 30 - April 27, 2019 - Presented by Village VW/Audi of Chattanooga! The race begins and ends at the Ocoee Whitewater Center. To enter the venue in the morning, you will need to actually drive past the Whitewater Center on US 64 and enter from the far end of the parking lot. It is $3 per vehicle to park, which you an pay upon arrival at one of the USFS kiosks. Once you park, walk across the bridge and make a left towards the picnic shelter, which is where check-in will be. PLEASE NOTE THERE IS NO OVERNIGHT PARKING AT THE OCOEE WHITEWATER CENTER - SEE CAMPING OPTIONS BELOW. 2:00 pm to 9:00 pm - Race number and t-shirt pickup at Whitewater Center Pavilion - THIS IS MANDATORY FOR 100 MILE AND 65 MILE - NO RACE MORNING PICKUP FOR 100 OR 65 MILE RACE. 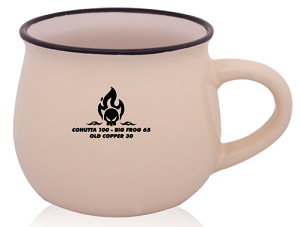 OLD COPPER 30 RIDERS MAY PICK UP SATURDAY MORNING. 8:00 pm - DROP BAG CUTOFF - The enforced drop-bag deadline is at 8 p.m. at the Whitewater Center pavilion. If you miss the cutoff you will need to carry your drop items or rely on the aid stations for fuel. We will provide you with one-gallon sized ziploc bags or you may pre-pack your own. 1. Print off the RACE WAIVER, sign it, AND give it to a friend to deliver to us during check in. Make sure you send your drop bags, as there is no way to deliver them to the Aid Stations on race day. 2. Your friend MUST pick up your race packet with your race number in it and get it to you before the race starts! If you do not have someone deliver the waiver and/or fail to get your number from your friend, you will not be able to race. 6:30 am to 8 am - Number/shirt pickup for Old Copper 30 racers only at Pavilion. Awards will be presented near the finish line when the top 5 finishers in each class have crossed the finish line. Please note overnight parking is not permitted at the Ocoee Whitewater Center. Another hotel option 5 minutes from the Ocoee Whitewater Center is The Ocoee Inn. All racers will receive a super comfy cotton blend tee AND custom Handup Gloves ($28 value) as well as a commemorative finisher mug. The shirts are soft, lightweight and are likely soon to be your favorite. These are available in unisex and ladies sizing. Ladies shirts are more fitted and longer...if you like a relaxed fit, order a unisex or size up in the ladies shirts. Please register by the April 13 shirt size deadline to guarantee your size, especially in Ladies sizes. We will order a limited number of extra shirts (all unisex) for late registrants, however sizes are first come-first serve as you register. You will receive a Mountain Goat Logo Shirt if you register late and we have run out of race specific shirts. 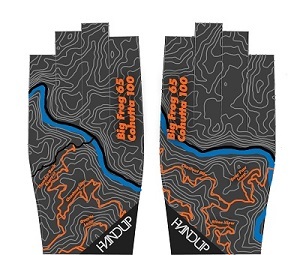 2019 Handup Glove Design for 65/100 riders. Old Copper 30 gets a slightly different, but equally awesome, design. Top 3 in Open Men, Open Women, Masters 50+, and Open Singlespeed in the Old Copper 30 will receive prizes from our sponsors. Friday April 27th at 8:00 pm - DROP BAG CUTOFF - The enforced drop-bag deadline is at 8 p.m. at the Whitewater Center pavilion. If you miss the cutoff you will need to carry your drop items or rely on the aid stations for fuel. We will provide you with one-gallon sized ziploc bags or you may pre-pack your own. Gallon size ziplocs are fine, as are standard grocery bags - just ensure your bottles won't leak on everyone else's stuff. Race course includes 6 Aid stations. Bags can be dropped at aid stations 1, 3, 5 & 6. See the maps on Courses page for aid station locations. Our Aid Stations are well stocked with fresh water and snacks, and be sure to carry with you the hydration and nutrition you require according to your training and health needs. Each racer is allowed three (3) one gallon drop bags. The race has two multiple pass aid stations for a total of 5 aid stops. These allow racers to access their drop bags at two Aid Stations once on the way out, and once on the way back. See the maps on Courses page for aid station locations. Our Aid Stations are well stocked with fresh water and snacks, and be sure to carry with you the hydration and nutrition you require according to your training and health needs. Each racer is allowed two (2) one gallon drop bags. Our Aid Stations are well stocked with fresh water and snacks, and be sure to carry with you the hydration and nutrition you require according to your training and health needs. Each racer is allowed one (1) one gallon drop bags. Typical Aid Station Fuel: Water, HEED, drop bags, mechanical support, soda, Hammer Gel, granola bars, Rice Krispy Treats, fig bars, peanut M&Ms, Skittles, Cookies, Bananas, and Endurolytes. No Transfers after 4/24 - NO EXCEPTIONS. No category or distance changes after 4/24. Once your registration is processed, there are no refunds. ENTRIES DO NOT TRANSFER YEAR TO YEAR NOR DO THEY TRANSFER TO OTHER MOUNTAIN GOAT ADVENTURES EVENTS. If you get hurt or need to bail at the last minute, that is a major bummer, but we still need to pay the expenses associated with you racing regardless of whether or not you are able to attend. To help you out with this, you may sell your entry to someone in the SAME EVENT without penalty (meaning no transfer fee) until April 23rd. You are responsible for finding someone to buy your entry as well as arranging payment with that person. Once you have all that squared away, please email lisa@mountaingoatadventures.com with the contact info for the person buying your entry, and I will send them a link to register. The person buying your entry will receive whichever shirt size you originally ordered.